Since the fall of Apartheid, South Africa has seen a massive boost in their tourism industry. People are coming from far and wide to invest in South Africa’s rugged landscape and develop an empire out of the violence and war that distracted it from development for so long. Cape Town is now a bustling city, more similar to some Mediterranean towns that other major cities in Africa. Yes, it is a common occurrence that people drive over-crowded and unsafe cars and the large and bustling townships on the outskirts of the city show no signs of dismantling, but if you enter Cape Town’s Waterfront, you will struggle not to compare it to San Francisco’s Fisherman’s Wharf or even the promenade in Marbella. Cape Town holidays are also a great excuse to see South Africa’s stunning Table Mountain. A stunning sight that can be seen for miles! What has really taken off is the huge selection of food options that the city has to offer. The Waterfront is ready to burst with the many options of cuisine. Sushi is a main favourite, as is fish and chips. The Karibu Restaurant offers diners an African experience with Crocodile Carpaccio a favourite on the chefs’ specials. Venture out of the waterfront and dip your toes in the sand and watch a magnificent sun down at The Grand Restaurant. Its name is well deserved. Favoured by Cape Town’s elite, its pizzas are wafer-thin and melt in your mouth. Their grilled kingclip, South Africa’s local fish is like a little drop of heaven. With a fresh glass of white wine it is possible to sit back, relax and enjoy the magnificent surroundings. 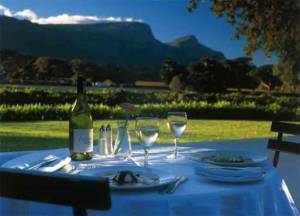 Venture out of Cape Town and into South Africa’s famous Winelands region. Its many vineyards are influenced by different European countries depending on who began the wineries. Many South Africa tours offer you the opportunity to sample wines with French, Dutch and even English influences and enjoy the distinctly European architecture that many of these wineries have. Their portions are generous, and after a couple of stops at different wineries on your tour of this marvelous region, you will start to feel quite drunk. Line your stomach with delicious cakes at one winery, or enjoy an authentic Braille at another. Gaze out at the inspiring views from the Delaire Graffe Estate. Before you know it, you will start to feel at home in this beautiful region.